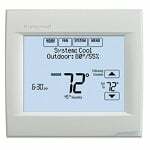 The Honeywell VisionPRO 8000 Programmable Thermostat (TH8321U1006 / TH8321U1097) is a universal touchscreen thermostat which is programmable for up to 7 days in advance. 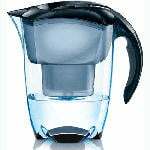 It features dehumidification control, automatic/manual changeover, and up to 3 heating and 2 cooling stages. 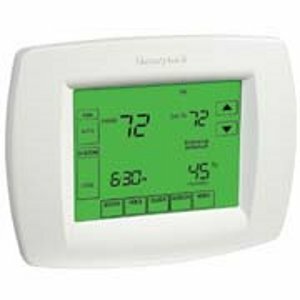 This Vision PRO touchscreen programmable Honeywell thermostat features electronic control of up to 24 Vac heating and cooling systems or 750 mV heating system. The Honeywell VisionPRO thermostat automatically lowers humidity levels in your home, working to de-humidify the air in order to protect hardwood flooring and other woodwork. The Honeywell VisionPRO 8000 digital programmable thermostat includes many novel features such as de-humidification control, a large and clear 10 inch green display with backlighting that displays current temperature and the time of day, menu driven programmming to easily guide you through the scheduling process, fine tuned temperature control (+/-1 F), multiple temperature HOLD options which allows you to modify the schedule indefinitely or for a specific time, keypad lockout options for partial or full lockout, temperature range stops which prevents a user from setting the temperature too high or too low, multiple change reminders to help the user(s) remember when to service or replace the air filter, humidifier pad, ultraviolet lamp, or thermostat batteries, specially-designed and trademarked Adaptive Intelligent Recovery which ensures programmed temperature is reached by programmed time, and Armchair Programming that allows you to remove the thermostat from wall to more easily set the schedule. Honeywell thermostats also work to more quickly remove air pollutants by exchanging the stale air in your home with fresh and filtered air from the outdoors. One of the key features of the Honeywell touch screen programmable thermostat is the ability to program it to your specific heating or cooling needs. Programming the temperature in your home is energy efficient and will save you money. For instance, if you are going on a trip or vacation you can set your Honeywell thermostat to turn on the day before you get back. If used as directed this touchscreen programmable Honeywell thermostat can save you upwards of 33% on annual heating and cooling costs. Additionally, the real-time clock of this Honeywell touch screen thermostat keeps time during power failures and updates automatically for daylight savings time. 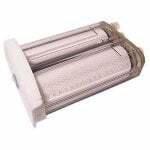 Detailed Honeywell thermostat instructions for installation and usage are included in the packaging of this product. More technical information about the Honeywell VisionPRO 8000 Programmable Thermostat can be found here.